If you’ve taken the time to read any part of this site, you’ll see a common theme: I love Asian cuisines, particularly Chinese. 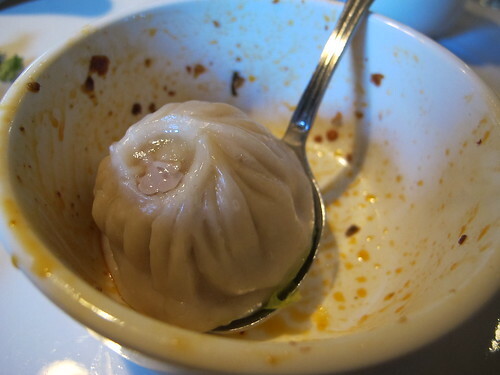 It seems that regardless of city, my first instinct is to seek out the best dumplings, dim sum, or noodle house. 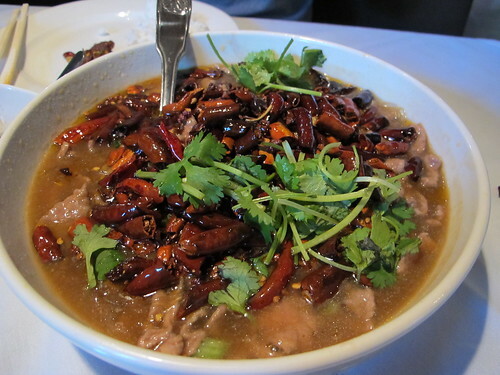 Of course, with my regular visits to Atlanta, I’ve enjoyed a fair amount of what Chinese food the city has to offer. 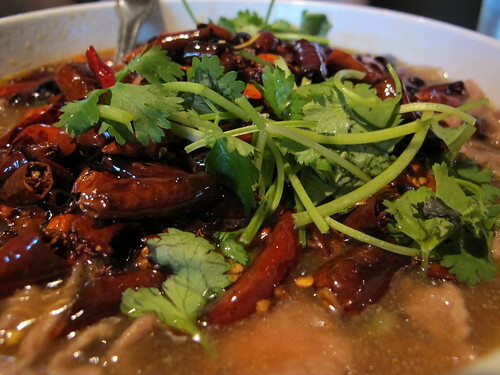 So, like everyone else, I read about Peter Chang’s new restaurant with anticipation. The man behind the legend was going to settle down at his own restaurant and Sichuan goodness will flow from the heavens. Well, that least bit may be a bit of hyperbole, but it seems appropriate. Having only opened on the 18th of December, I knew there would still be some new restaurant jitters, but that wouldn‘t be enough to deter me from enjoying high quality Sichuan food. So on the 31st, before I began driving back to Jackson, I convinced Aaron and Jennifer that we needed Peter Chang’s for lunch. 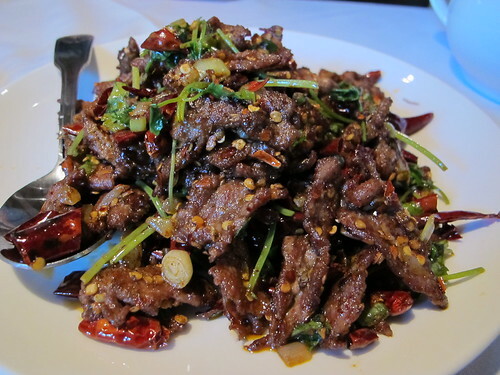 As is the case with most Chinese restaurants, there’s a fairly expansive menu at Peter Chang’s. I love to go into detail about the sections and the variety of dishes, but the truth is I really don’t remember. Of course, a take out menu would be very beneficial, but Peter Chang’s was unprepared in that category. That being said, the three of us still ordered a multitude of dishes, regardless of category. The first dish to make it out of the kitchen was the Hot & Dry Beef. 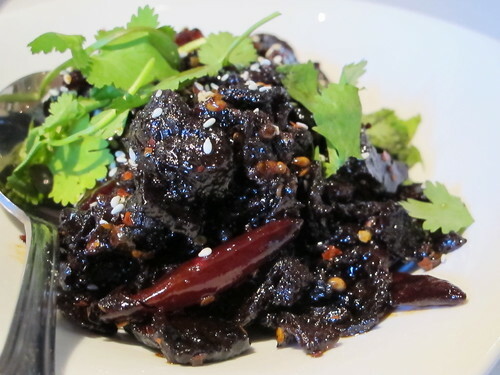 At first glance this looks like a plate of sticky beef jerky that’s been covered with chili peppers and sesame seeds. I suppose, in some respects, that’s not too inaccurate. This was a plate of very dry but highly seasoned and highly flavorful beef. Each piece was covered in a slightly sweet sauce surrounding a piece of dry meat with a highly compounded beef flavor. With each bite, there was a growing, lingering background spice. This plate was sticky, sweet, and packed with a nice chili laden kick; I really enjoyed it. Dan Dan Noodles was the next dish to appear at our table. There’s something ethereal about a good bowl of Dan Dan Mian. 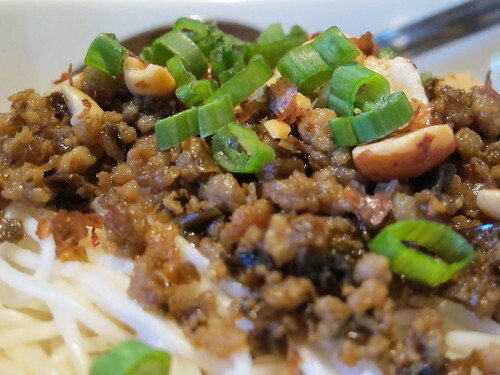 Once mixed and dished into a small, more user friendly bowl, I was surprised at the flavors in this version of Dan Dan Noodles. 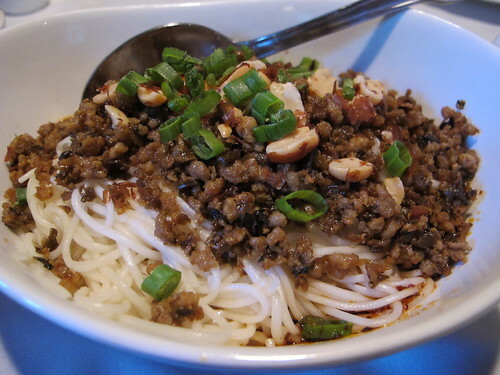 These noodles weren’t particularly spicy nor did they feature an overwhelming numbing effect from Sichuan peppercorns. The combination of pork, peanuts, and chili flakes wasn’t overpowering but satisfying. What was in the bowl was a rather oily batch of noodles that was simply delicious. 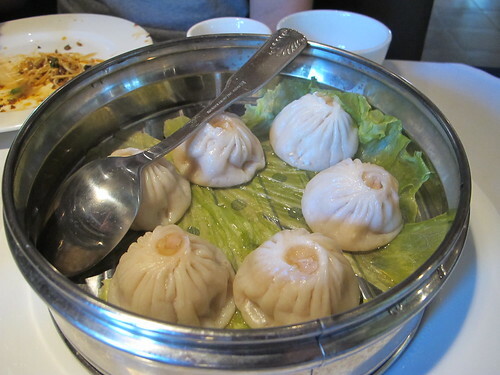 Even though they’re a little out of a place on a Sichuan-centric menu, we had to order the soup dumplings. 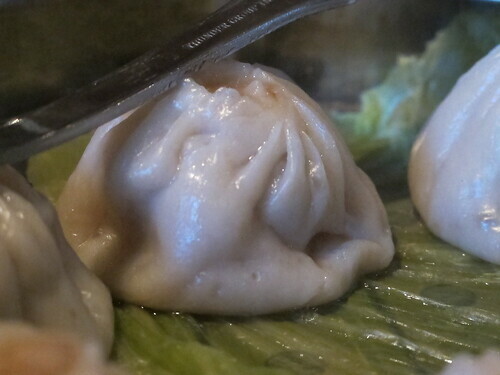 These xiao long bao are just what you’d expect, a doughy wrapper holding a pocket of unctuous broth and pork filling. I still haven’t developed an eye for judging if soup dumplings are premade or homemade but these were quite tasty regardless of origin. All the dumpling needed was a spoon and a little bit of chinkiang vinegar. 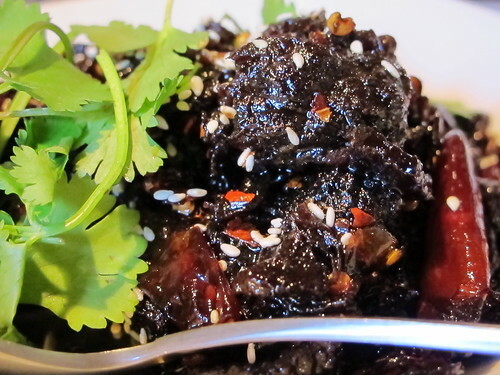 Ever since I first made my first plate of Cumin Beef or zi ran niu rou, I’ve become mildly obsessed with the dish, ordering it every time I see it on a menu. This is the most beef I’ve ever seen in an order of zi ran niu rou. Immediately, I was amazed at the cumin flavor to this dish. It was fresh, not the odd dusty flavor that I usually associate with cumin. In addition to the cumin, there seemed to be three notes: chili peppers, beef, and heat. It’s a simple chord, but an oh so tasty one. 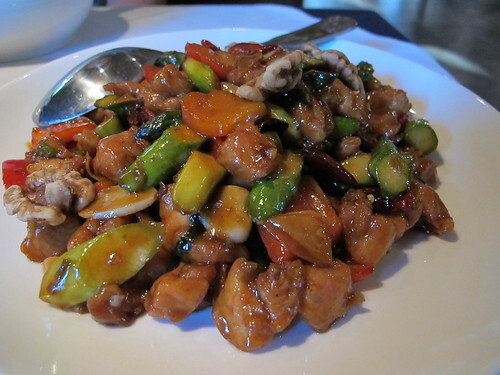 Kung Pao Chicken, it may seem like your quintessential Chinese buffet item, but I was curious to see how Peter Chang would spin the misunderstood Sichuan classic. Going straight for the chicken, I was amazed at the juiciness and tenderness of each piece. While there was a pleasant, tolerable level of heat to this dish, this Kung Pao Chicken seemed to have a very Americanized feel to it. I suppose I was expecting more pungency from vinegar or peppers, but that’s a small complaint. What really surprised me was the appearance of asparagus in the dish. Asparagus is one of those vegetables that I rarely see in Chinese cooking, so imagine my surprise when I found perfectly cooked pieces of asparagus mixed in this chicken. 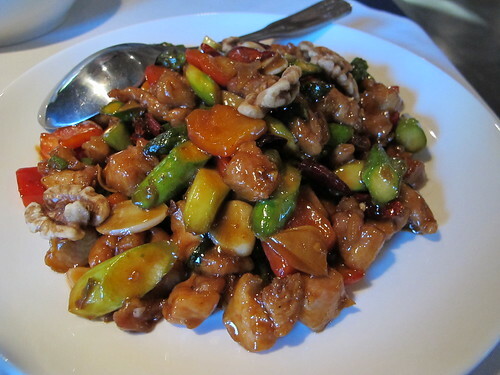 Combined with the chunks of bell pepper and ginger, this was an excellent version of Kung Pao Chicken. 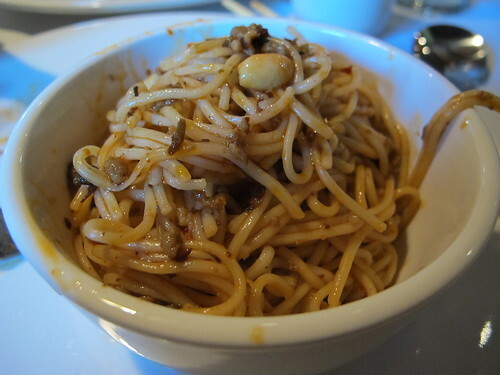 At Peter Chang’s, the next dish is known as Beef and Noodles in Chili Oil, but I first encountered it under the name shui zhu niu rou or Boiled Beef Slices in a Fiery Sauce. 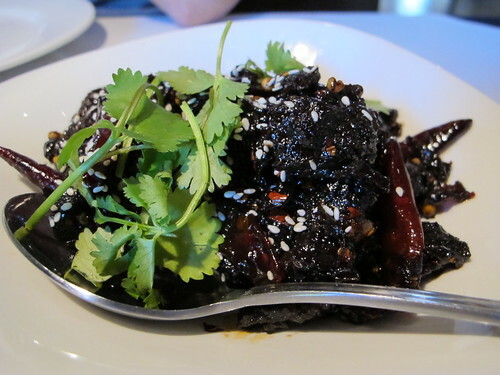 I’m always searching for a dish that will give me a big punch of “ma la” from Sichuan Peppercorns and spiciness from chili peppers, this dish was just what I was looking for. Loaded to the gills with peppers, there was actually a rich chicken broth in the bowl, but it was almost forgotten in the flood of Sichuan Peppercorns and chilies. Once I became acclimated to the numbing sensation, I could focus on this excellent bowl of beef and noodles. It was rich, beefy, spicy, really everything I could want in a bowl of shui zhu niu rou, best of all, I was able to enjoy the full force of a proper helping of “ma la”. 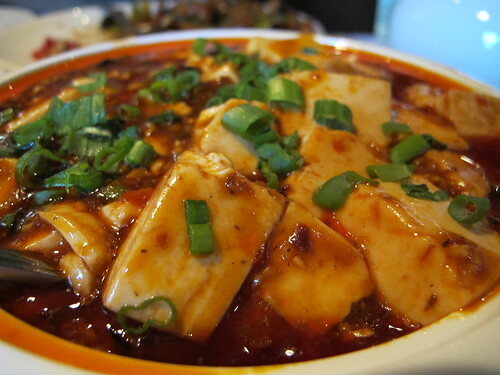 As if the boiled beef wasn’t enough of a Sichuan sucker punch for one meal, we finished with an order of Mapo Tofu. With its big silky blocks of tofu, and a vinegar-tinged sauce, this was the perfect way to end the meal. 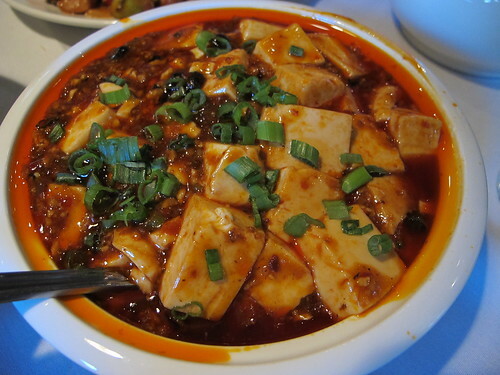 Combined with the Beef and Noodles from earlier, my mouth truly went numb after the Mapo Tofu. This was one of the strongest versions I’ve ever tasted. So while it may not be the meatiest, it’s certainly the most potent and that’s worth a second order in my book. Despite our usual overzealous ordering, we only scratched the surface of what Peter Chang’s had to offer. 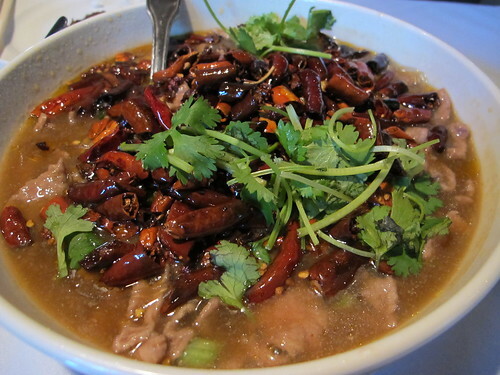 There are so many more Chef’s Specials and Sichuan Favorites that I’m chomping at the bit to try. 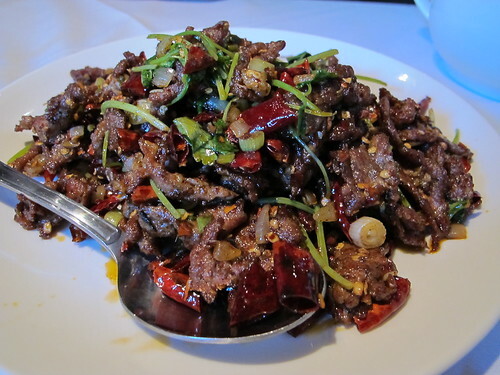 I’ve eaten at a Peter Chang restaurant before but after this meal I can see why Atlantans clamor to enjoy his pepper laden Sichuan dishes. 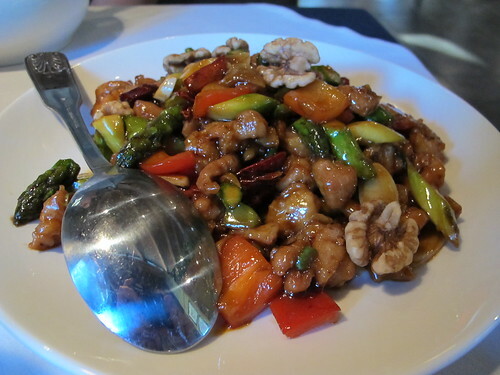 with all the Sichuan cooking you do/eat, I'm glad you got to try Chang's. Sometimes the ma la is dumbed down, but we emphasize it to our waitress that we want them to bump it up. Don't miss the twice fried pork belly next time. Unreal.